Inder Loves Folk Art: Sick. We have some kind of nasty ick here - fevers, snot, and coughing. Steve sounds like an old man with tuberculosis. So does Joe, for that matter. I was sick all week, had no voice for three days, and I'm still not back to normal. (By the way, for a really good time, try disciplining a three-year-old when all you can get out is a hoarse whisper.) Maggie, thank goodness, seems to have a milder version of the bug (yay breastmilk! ), but she cut her first two teeth on Thursday, so she's not her usual happy self either. The baby tylenol has been flowing in these parts. Ugh. The only thing worse than having to parent a sick kid when you are sick yourself is having to parent two sick kids. Kill me now. But, look ma! I did some sewing! I have forbidden myself from buying any more knit fabrics until I make a dent in my stash of thrifted t-shirts. Meanwhile, my kids are growing, winter is upon us, and everyone needs long sleeved shirts. So in between medicating my cranky kids, I whipped up a couple of long sleeved tees yesterday. 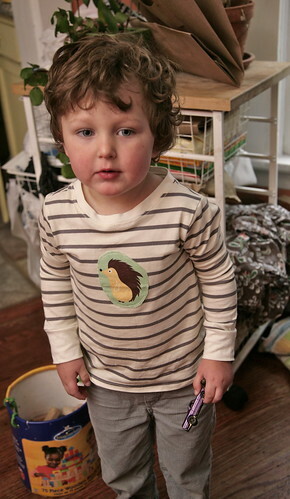 Joe's is the Flashback Skinny Tee, of course, in a size 4 (he's getting so big! sniffle!). The fabric (including the cream ribbing) was harvested from a size XL women's shirt. It needed a little something, and I decided that "something" should be a hedgehog. Not the best photos - bad lighting, sick grouchy kid - what can you do? 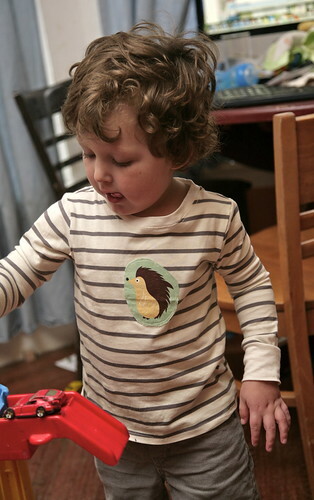 Continuing the theme, Maggie got an owl shirt to match her owl pants. 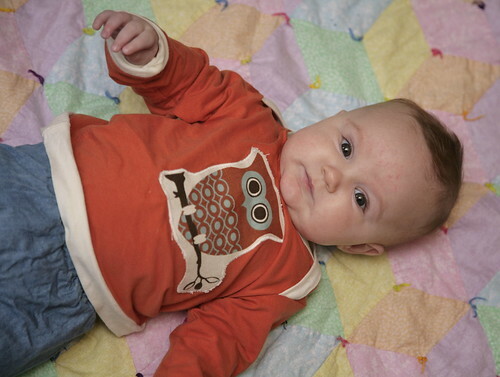 The awesome owl fabric came from Christine, a.k.a. Oakrosemama. We've been doing a scrap exchange, and it's great. I find I hardly ever use my own scraps unless they are very precious (probably because I still have yards of most of the stuff in my stash), but I am very motivated to incorporate other people's scraps into my sewing. The pattern probably looks familiar as well. It's the envelope tee from Growing Up Sew Liberated. I cut this one out in size 6-12 months, and it is a bit roomy, but by no means enormous. Both of my children are growing so fast these days! The pumpkin-colored knit was also a thrifted t-shirt, and the white ribbing came from the same shirt I used for Joe's shirt. So that's two pieces of stashed knit, turned into cute clothes! Am I allowed to make a Spoonflower order yet? Thank you so much for all of your congratulations and words of encouragement on my last post. This week will be my last at my current job (my to-do list includes cleaning off my desk, updating my files, passing off work, and getting taken out to lunch multiple times) and I start my new job a week from tomorrow. Exciting, busy times! Everyone feel better soon! And yay for scraps! For me once I made what I'm going to make, that fabric has been used and the scraps are just not as exciting any more. But new scraps from someone else hold some kind of promise. How can I use this? I am coveting all the corduroy scraps you sent! Also I love the stripe/hedgehog combo. If i could only get into knits..but hey I'm going to save my old knit tops, maybe that will be inspiring? I hope you are all better very soon! Great shirts, especially the owl! Making some of those envelope shirts from Growing Up Sew Liberated is near the top of my to-do list. Those are some beautiful children, right there. I love their new shirts. Feel better soon! But if in some strange way the sick has inspired some sewing time, well, there's a silver lining after all. Oh, you poor things, I think everyone I know has been ill during November but it's always worse when you're looking after a young baby. I hope you're all feeling better soon. Those tees are so cute, I am so impressed you managed to fit in some sewing. I've had one of those envelope tees cut out for a little while now. I should probably finish it before it's too small. Enjoy your last week and good luck with the new job. Look at you all sick and yet still sewing up a storm. Are you sure that you're sewing superhero? love these! so darling! hope everyone is feeling better now, too! massage therapist can sometimes be a tough search. in that case the individual is considered disqualified from engaging in clinical practice if not certified.